Digital photographic image technology, representations, formats, Linux software tools for image viewing, resizing, editing, graphics editing, graphics design, panoramic stitching and spherical panoramic photography software for Linux. 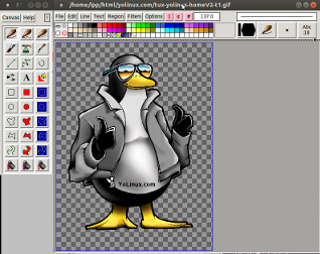 Most of the image editing and processing tools discussed are Free and Open Source Software (FOSS) based tools and all are available on the Linux platform. Color is the human perception of various frequencies/wavelengths and intensity of light (electromagnetic radiation) based on an object's physical properties such as light absorption, reflection, or emission spectra. Colors are defined and quantified by the degree to which they stimulate human cone cells in the retina. For humans, this is known as "visible light". Digital monitors: The representation of Red, Green and Blue (RGB) combined (additive coloring) to radiate light in various quantities to achieve the appropriate color. Each color can be represented by individual numeric quantities. The combination of all colors renders white. Digital printers: Cyan, Magenta and Yellow (CMY) combined (subtractive coloring) to absorb light in various quantities to achieve the appropriate color. The combination of all colors renders black. Primary colors are red, blue and yellow which can be combined to any other color (used in the arts and painting world). Hex representation of the digital representation of colors: The more bits which are assigned to represent a color, the more shades that can be represented. Twenty four bit color uses eight bits to represent each of red, green and blue. Eight bits can represent a number from 0 to 255 (0 to FF in hex). TIFF Tagged Image File Format: supports a wide range of options. Most applications only support a subset of TIFF called baseline TIFF. Lossless LZW compression. TIFF also supports Zip lossless and JPEG Lossy compression. Expired Adobe ownership. Used by scanners and professional photographers. Not a good web format. GIF Graphics Interchange Format: 8 bits/pixel, color-map of 256 colors from a 24 bit RGB color-space. Lossless compression (LZW). Good for simple images. Patents were owned by Unisys and Compuserve. Patents have expired. Supports interlacing, animations and transparency. GIF uses only 256 colors. Best for non photographic images with fewer colors, like icons. 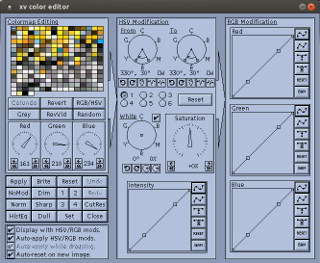 PNG Portable Network Graphics: 8 bit (256 colors) and 24 bit (16 million colors) color palettes. Lossless MNG compression thus tend to be larger files than equivalent JPEG. 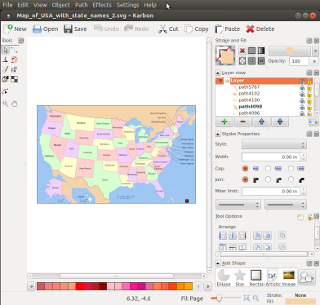 Supports multiple representations for color palette index (color map). Supports transparency, interlacing, animations. Comparable to GIF without the 256 color palette limitation. JPEG better choice for web images. Supports alpha channels (transitions from opaque to completely transparent). Great for use with transparent backgrounds while not having jagged boundaries. BMP Microsoft bitmap image file: Supports multiple compression methods or none and multiple bits per pixel varieties. RAW no compression. Full color (no translation to color map). Direct dump from camera. No compression thus large files. Hundreds of formats due to variations in cameras CCD, resolution and sensitivity. SVG Scalable Vector Graphics: coordinates for line segments and curves. Not an pixel raster image. Also see the YoLinux image mime type example tests. HDR Photography is an attempt to even out extreme contrast ranges in light exposure. Extreme contrast ranges can have the effect of clipping dark regions to areas of the photograph which are all black and bright regions to areas of all white. HDR photography is accomplished by taking several images of the same subject and varying the exposure (fraction of a second), the aperture (f-number) and sensitivity (iso value). This is called 'bracketing'. 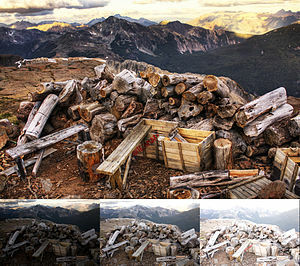 The bracketed images are combined to form a "tone mapped" image by taking only the properly exposed pixels of each image which are best suited for display or print. The tone mapping reduces the dynamic range of the image while retaining the local contrast between pixels. Exposure fusion is a similar and more simple technique creating the resulting tone mapped image directly from the bracketed exposures without generating the intermediate HDR image. OpenEXR is a high dynamic-range (HDR), high color fidelity image file format (.exr) developed by Industrial Light and Magic for digital imaging. The OpenEXR format was used in the movies Harry Potter and the Sorcerers Stone, Men in Black II, Gangs of New York, and Signs and is ILM's primary image format. Also supports transparency. There are also open source libraries available: IlmImf, lmath and an image display application "exrdisplay". 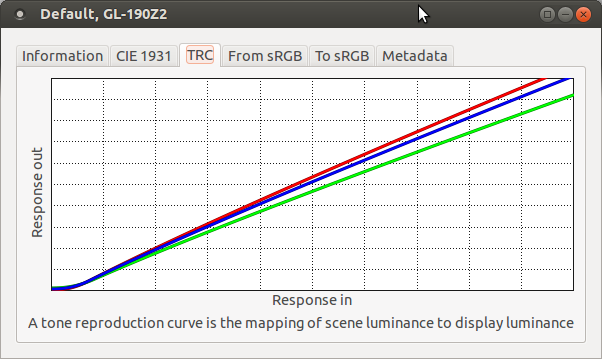 RGBE HDR Radiance (.hdr) source images use a four bytes (a full 32 bits) to store pixel information. It avoids clipping by offering a higher range of values by using the fourth byte to store exponent information for the quantity of light per pixel. The first three bytes are RGB color data. 32 bit floating point TIFF supported in current COTS imaging programs. Photoshop PSD and PSB large document format supports 32 bits, 300,000 pixels in any dimension. Support limited to Photoshop. Generate tone-map HDR image files (OpenEXR, RGBE, TIFF or PFS) from a set of JPEG, TIFF or Raw images with QtpfsGui or the Gimp plugin Exposure-blend. Also see Linux and HDR workflow. White Point: native white for the display. Typical values: 5000 to match print media (number refers to a temperature in degrees Kelvin). Tone curve/gamma: default is 2.2. 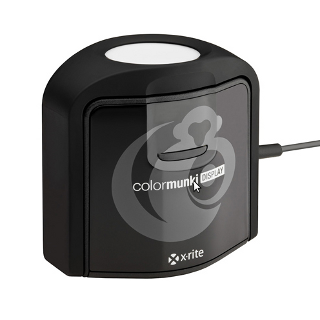 The "Colorimeter" and affiliated software are used to generate an International Color Consortium (ICC) color profile which can be used to adjust your graphics card and monitor to display the correct colors. The ICC profile of a device (monitor, camera, scanner, printer, ...) describes the color reproduction characteristics for the device. The device profile is stored in a display.icc file representing the ICC color profile for the device, in this case a monitor. 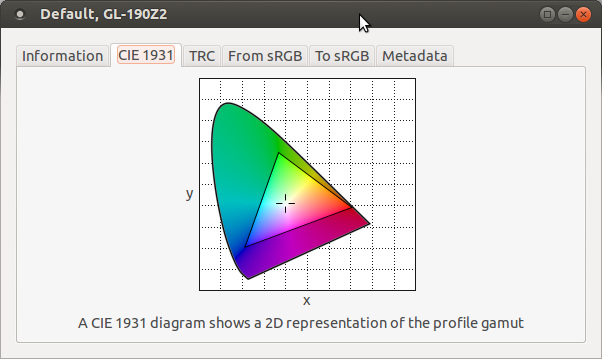 The ICC profile is a table describing the properties of a color-space (range of colors). A device with a large color-space is preferred. Select "View details". If a colorimeter is connected, the "Calibrate..." option will not be grayed out. 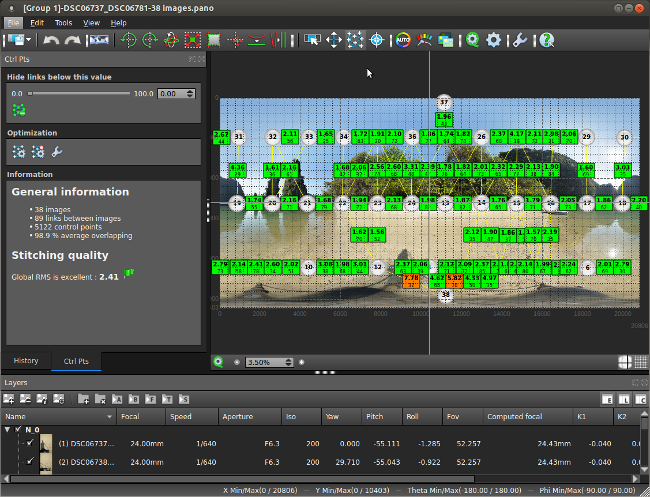 The following software can calibrate, generate profiles and set the video card gamma table with corrective parameters. The software also supports verification of settings. 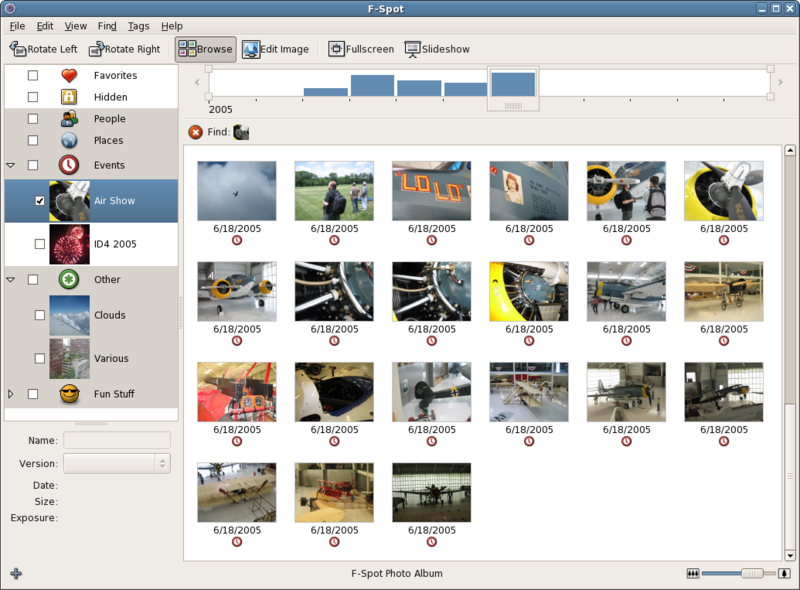 Photo manager and camera image offload program with built-in monitor calibration interface. 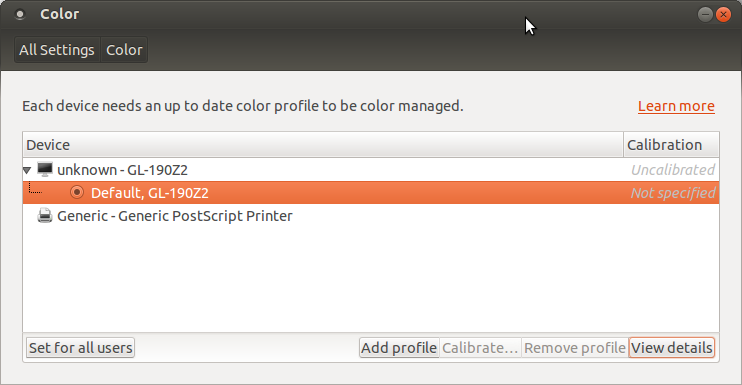 Select "Color Management". Colorimeters, also known as Spectro-Colorimeters or Spectrophotometer, are color measurement instruments which are required to measure the color output by the monitor. The products shown are USB devices which are manually placed against the screen to measure display color from known spectral image samples. 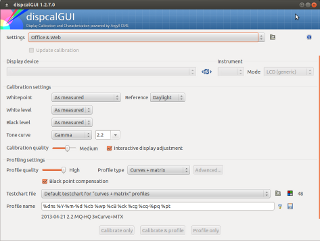 Monitor calibration based on Linux and open source. They ship a USB based colorimeter and a Linux LiveCD. Pixel based image processing allows for editing and enhancement of photos and photo image based file formats like JPEG. Vector graphics images are not stored on a pixel basis but on a geometric basis of points, lines and curves and are more popular with graphics designers. Thus the editing must be performed on the geometry. Hybrid editors are becoming popular which allow the use of vector graphics and pixel based images. Eye of Gnome: Supplied with most distributions of Linux as the default desktop image browser for systems using the Gnome desktop. Mostly used for viewing image files. Editing is limited to scaling, rotation and flipping of images. 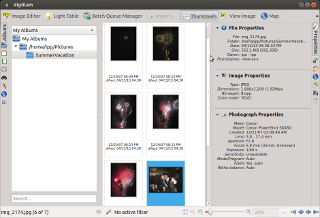 F-Spot: personal photo management application for GNOME. Simple image editing (crop, resize, red eye adjust). 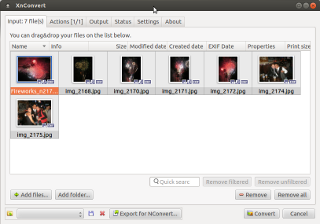 Gnome camera image import, viewing and photo organization program. Supports simple image editing such as rotation, crop, red eye reduction, exposure adjustment, color saturation and tint as well as web sharing to popular photo sharing web sites. Very time and date-centric. I still prefer organization by directory. 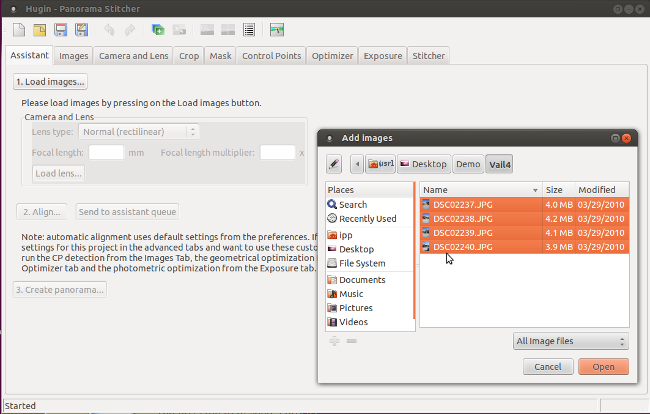 KDE camera image import, viewing and photo organization program. Supports JPEG as well as RAW camera imports and tweaking. Supports geo-coding and processing of negatives. Supports display monitor calibration. Organization by directory with storage of meta information makes it a little more flexible than Shotwell's mandated time stamp directory organization. DigiKam has strong photo search capability due to meta-tagging photo information. 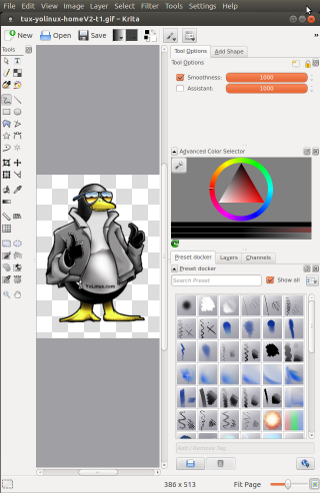 Image viewer for the KDE desktop. Viewing and image interrogation. Has sharing interface for most of the popular image sharing web sites. Editing is limited to image resizing, rotation, flipping, cropping and red eye reduction of images. Legacy viewing and image manipulation tool. 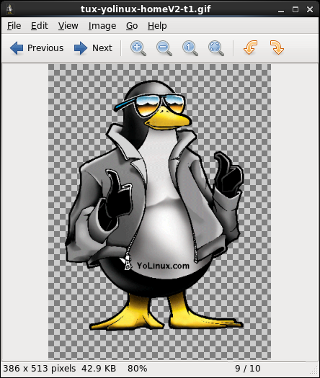 Edit image with full view of inner workings of the image file such as Gif color-map, color saturation, etc. 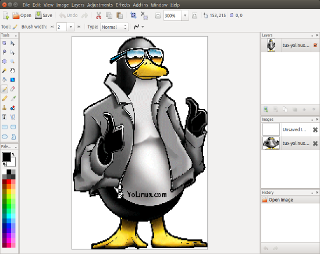 One of the first FOSS image viewing and editing software applications available on Linux/Unix. 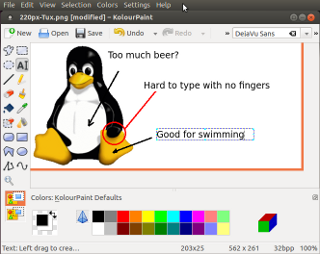 Paint program, simple image raster annotation (add lines, arrows, curves, circles, boxes, text). Simple graphic generation. Not a photo editor although it can import photographic images for markup. 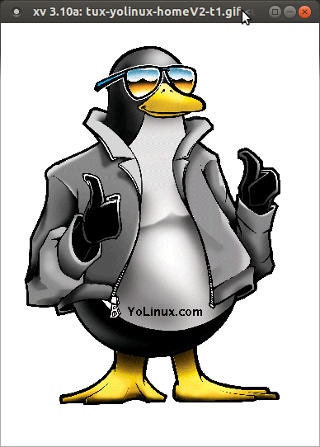 Supplied with most distributions of Linux as the default desktop image tool. Fully featured editing and pixel image manipulation tool. Many plugins available. Photoshop "like" image editing supporting layers, color editing, perspective and distortion correction, colorizing, image retouching, transparency, sizing, rotation, format conversion, text support, etc. Circle identifies pixels to clone over artifact identified by point of arrow. 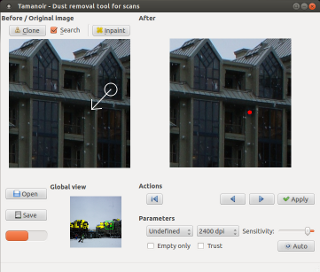 Image processing tool to remove small dust artifacts from picture scans. Auto identify artifacts or manually move green box to artifact. 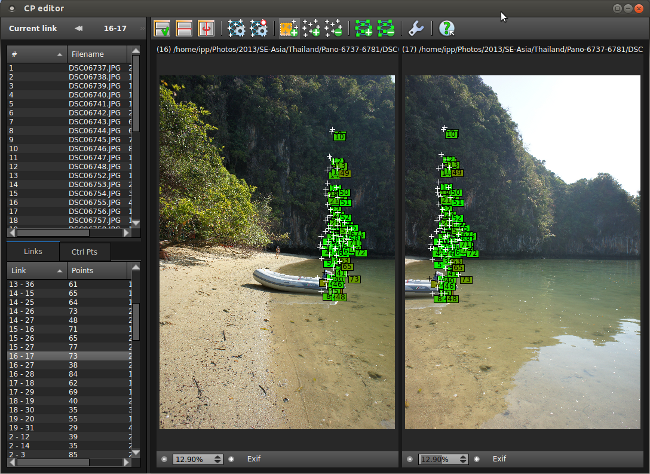 Clone mode will identify source pixels to clone and arrow will show artifact (pixel clone destination). Left window shows original image while right window will preview the changes. Strength: Capable of converting between hundreds of different image formats. Use other tools for editing. Online web tool. Upload photos and simple edit online. Format conversions. Very limited editing capability. 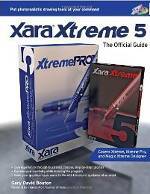 Note that while Xara Xtreme can edit and manipulate pixel images, Xara is primarily a vector graphics tool and as such is listed below. 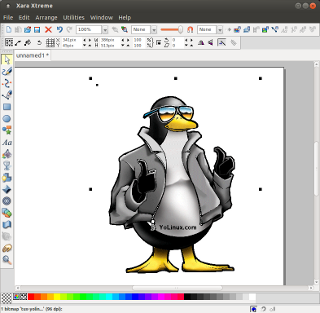 Note that Kara Xtreme and Krita have combined support for pixel and vector graphics. Desktop photo image manipulation, image editing and vector graphics design software. Claims to be very fast with live interactive image updates (not command then wait, fully interactive image adjustments and changes). Based on wxWidgets GUI framework. Photo image editing (red eye reduction, color balance, tones, shadows, color blending, special effects, fades, frames, feathering, lighten/darkening, transparency support). Although it supports so many image editing features, it is not a pixel editing tool. Supports the generation of graphics, text, complex polygons and Scalable Vector Graphics (SVG). Supports most Adobe Illustrator drawing features. Supports Adobe Photoshop and Illustrator files as well as Photoshop plugins. 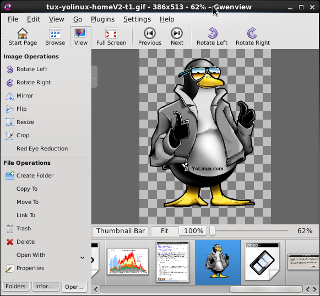 GNU open source with impressive professional graphics capabilities. Generate and edit Scalable Vector Graphics (SVG). Native file format is SVG. 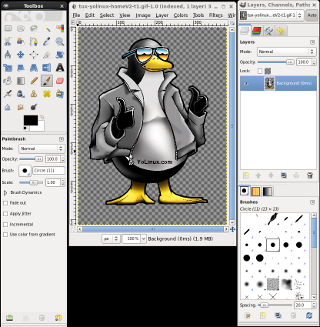 KDE desktop tool to generate and edit Scalable Vector Graphics (SVG). Support for ODG, SVG, WPG, WMF, EPS/PS vector formats. Drawing and path editing support. Derived from Gimp, KOffice/Calligra KImageShop. Painting and image editing. Combines pixel and vector layers to support paint (brushes, patterns, textures and gradients) and illustrator (lines, curves and polygons) features. Supports HDR (Open EXR) and ColorIO for visual effects work. Commercial application but open source. Free and supported versions (which also has extra capabilities). Java based cross platform application. Source and binaries available. 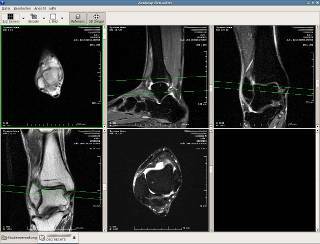 This medical image viewer can query and fetch DICOM images from network archive PACS nodes. 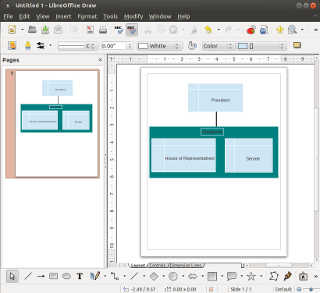 Open source based on gtkmm, glademm and gconfmm. Supports multiple image layers, image intensities, grey-scales and color schemes with threshold control. Also supports volume rendering (voxels) with various viewing angles and slices. 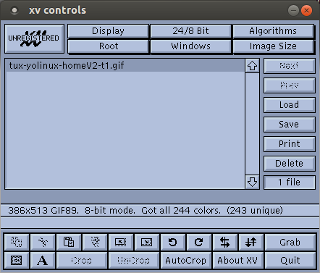 GTK2 based GUI. 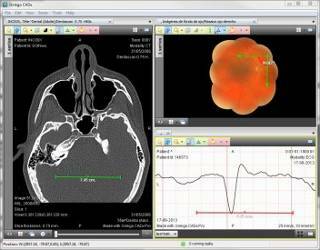 XnView Commercial application. 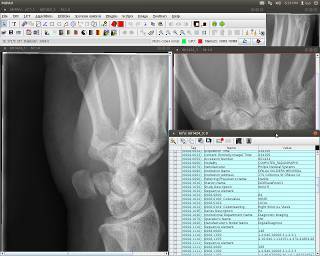 A general image viewer which also happens to support viewing DICOM images. Fotoxx - image navigation and edit. Edit image metadata (tags, geotags, dates, ratings, captions...). Batch operations available. GtkRawGallery - workflow oriented photo retouching software for camera raw image development. LightZone - digital darkroom software for RAW processing and editing. Unique use of layers. Photivo - denoise, sharpen and local contrast (fake HDR) algorithms for editing RAW and bitmap files (TIFF, JPEG, BMP, PNG, ...). For use in workflow with digiKam/F-Spot/Shotwell and Gimp. 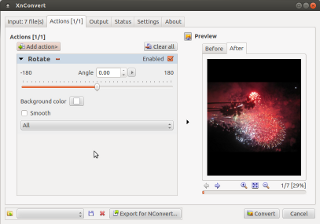 Shotwell - photo manager for GNOME. Video and RAW photo support. Simple photo editing and enhancement. I have always been able to read digital cameras with Linux either using the USB interface or removing the SD card and putting it in a USB attached SD card reader. No special drivers are required. 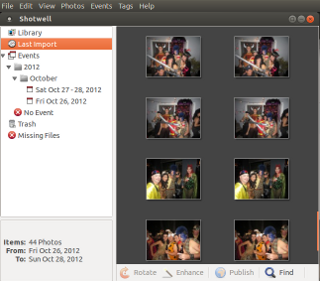 Using the Gnome Nautilus file browser I have always been able to download photos and video. Note the difference between the package names "exfat-fuse" and "fuse-exfat" used for the older 12.04 release. Satellite sensors often gather data in frequency bands invisible to the human eye or in ranges too sensitive for humans to distinguish as different. Image file formats cater to human vision and are usually not valid formats for the frequency spectrum gathered by the sensor. This is true for infrared sensors, chlorophyll and organic carbon studies, etc. For this reason, satellite sensor data is not stored in standard image formats but more typically in HDF format which hosts an internal hierarchical data schema specific to a given sensor. 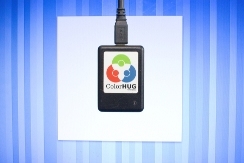 Sensor data can be mapped to various colors for human display and study. Tools like HDFView can generically view and plot graphs of the raw numerical data. Image tools like SeaDAS can generate image displays of the data. GDAL and GMT are typically used when earth projection and warping of data to the globe and vice versa are required. NASA Satellite sensor ocean color data and image downloads - publicly available raw satellite data (HDF5) for various satellite sensors, various parts of the planet and for various dates and times. 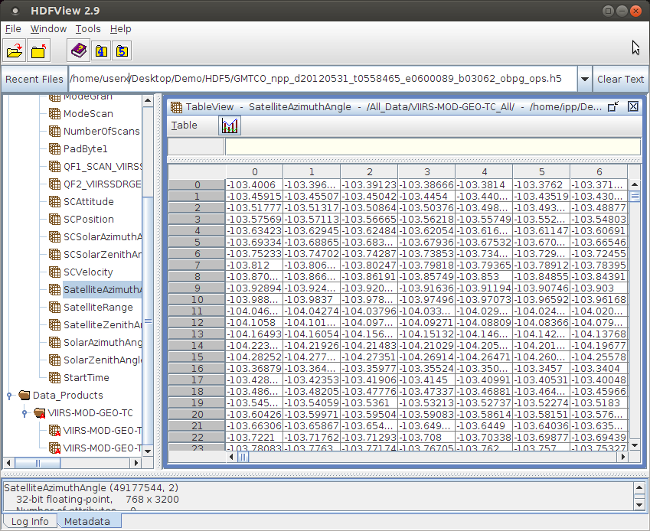 HDFView - Java file viewing GUI for HDF4 and HDF 5 files. Tree view on left shows data schema while right hand side shows the data. Select the graph icon to plot data. SeaDAS - SeaWiFS Data Analysis System (SeaDAS) to process, display and analyze satellite ocean color data. 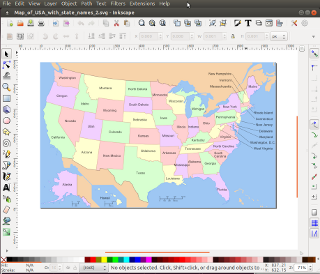 Supports statistics and plotting functions, map re-projection and geo-coding. GDAL - Geospatial Data Abstraction Library - GIS tools from the "Open Source Geospatial Foundation". Raster geospatial data format translation library and command line tools (translate, warp, etc for raster and vector data). Released with FWTools (compiled binary downloads [alt]) includes GDAL, NetCDF and other library dependencies. 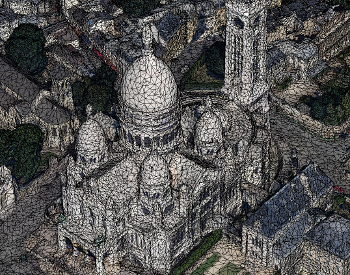 FWTools is a set of GIS tools for raster/vector viewing, projection and mapping/cartography. Includes OpenEV geospatial data analysis viewer for raster and vector data. Steganography is the technology of embedding a message within an image. It is not visible and typically requires a password and decryption to extract. Steganography can also be used to mark images with digital watermarks for identification. 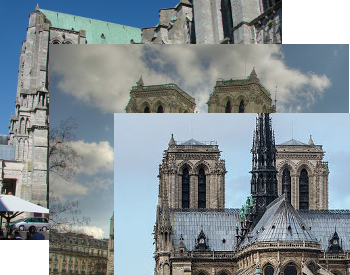 Hugin has matured greatly and is a solid panoramic photo stitching tool. It supports a fair amount of automation including automatic generation of control points and stitching as well as very esoteric and advanced support for HDR, lens distortion, exposure optimization and horizon straightening. Load images: select the images to load. Align images: select the "Align..." button and after processing, the preview panel will display. Create panorama: Using the defaults will generate a project file and a TIFF image. 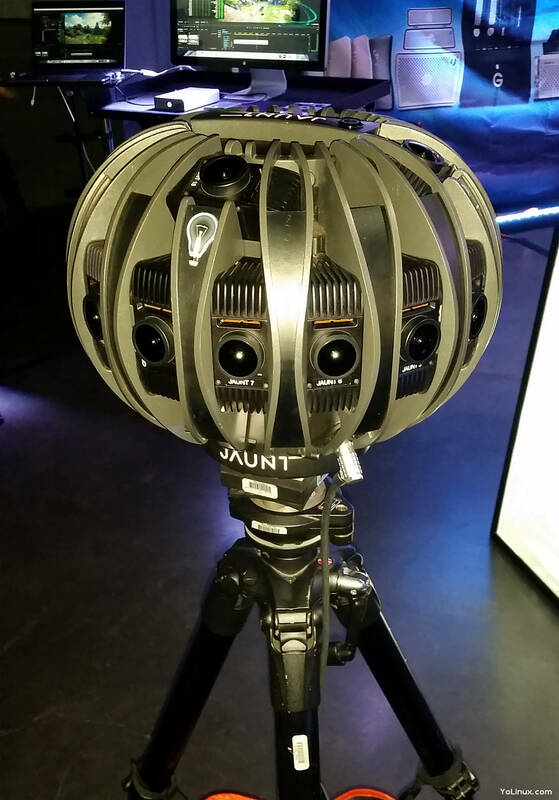 Spherical Panoramic Photography allows for 360 degree horizontal panoramic coverage as well as 180 degree vertical viewing. The resulting image is an immersive all-around view from a single location. Spherical Panoramic Photography is enabled by using a Spherical Panoramic tripod head which rotates the camera about its focal point to avoid parallax and allow seamless photo stitching of images. 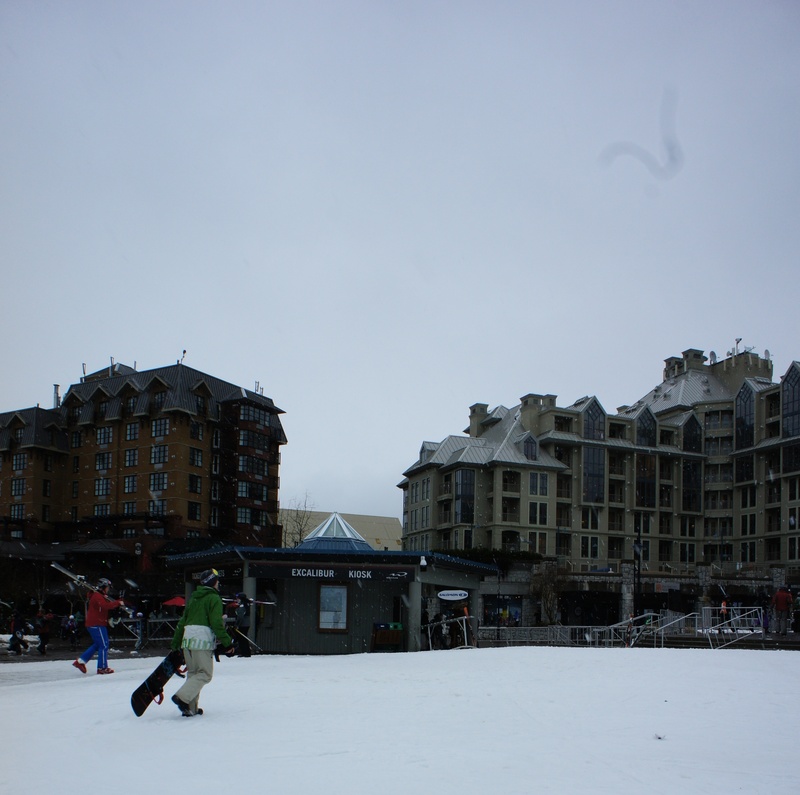 Spherical Panoramic cameras are available which take a single pano shot. This is enabled by the use of multiple CCDs and wide angle lenses or curved mirrors which broaden the field of view to 360 degrees for a single CCD and lens. [Potential Pitfall]: Upgrading failures are best mitigated by deleting the package (eg sudo dpkg -r panotourpro or sudo dpkg -r autopanogiga) and then re-installing. 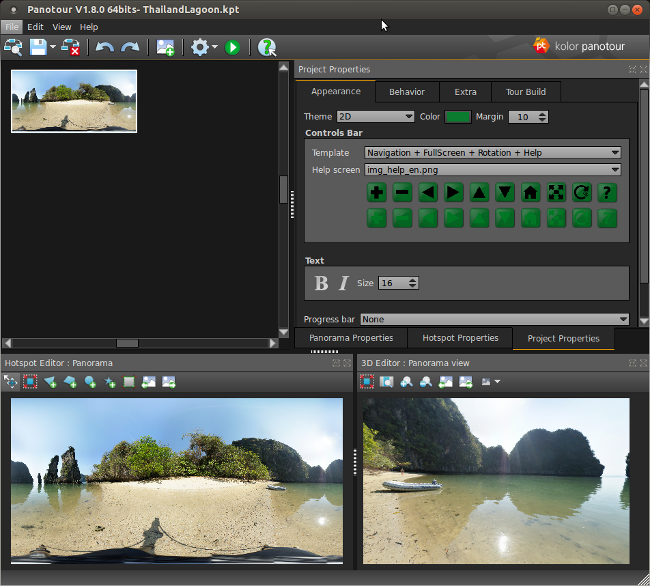 [Potential Pitfall]: The LivePano product (embedding a video in a spherical panoramic image) does not "build" a tour on Linux and their support on this product is completely unresponsive. 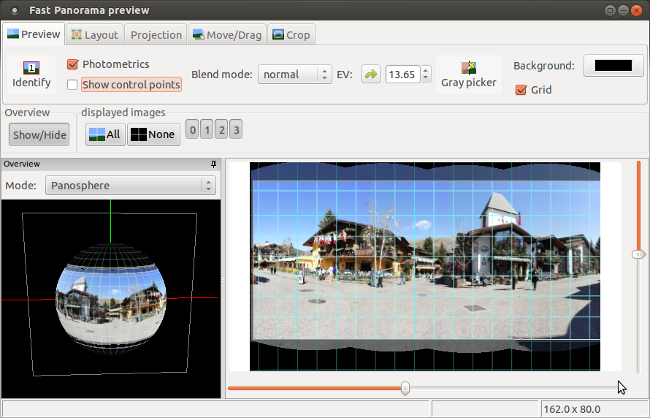 Panini perspective tool (PVQT): generate perspective views from panoramic and wide angle photographs. 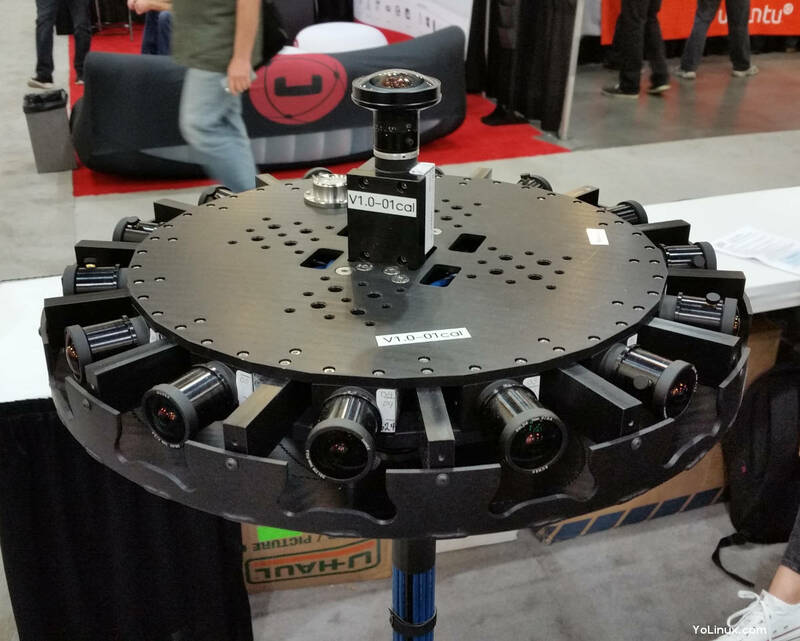 Cara VR - Nuke plug-in for 360 degree video and video stitching. SGO: Mistika VR - S.U.S.E. Uses Hugin to generate a template. Requires NVidia CUDA GPU enabled graphics card. 360Heros.com - GoPro 360 video mounts for 6 or more cameras. Stereo 3D spherical panoramic mounts also available. 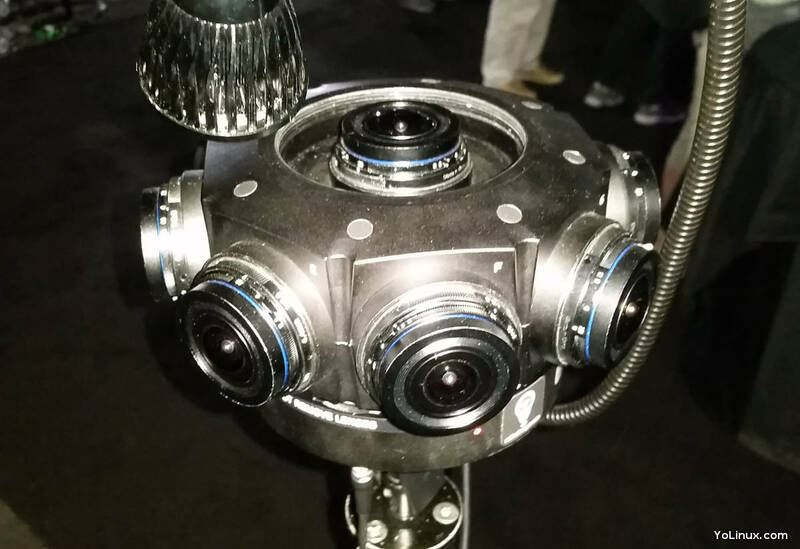 Facebook has open-sourced both the hardware design and software for their Surround 360 project. 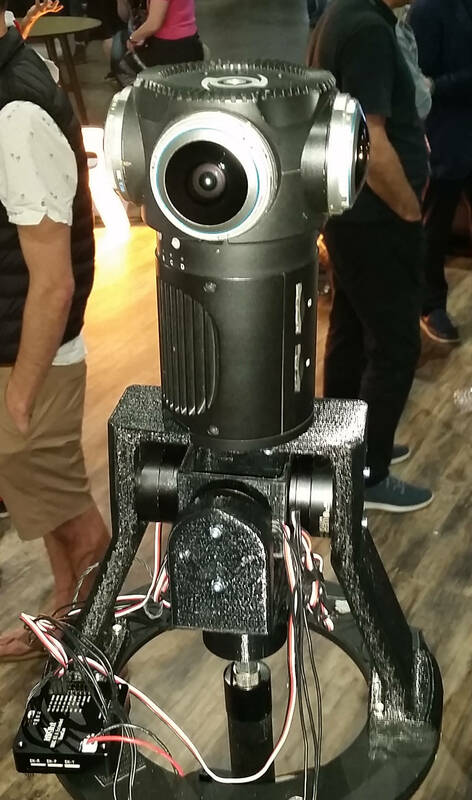 Surround 360 is a 3D stereo VR spherical panoramic video project for use with a VR headset (eg. Oculus). 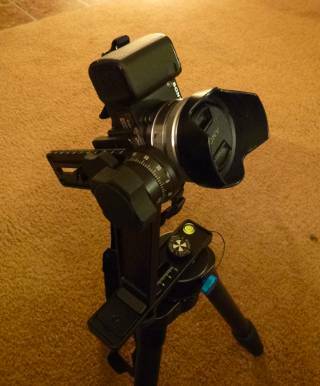 The hardware rig holds 17 industrial cameras connected by USB to a computer dedicated to capturing the video. 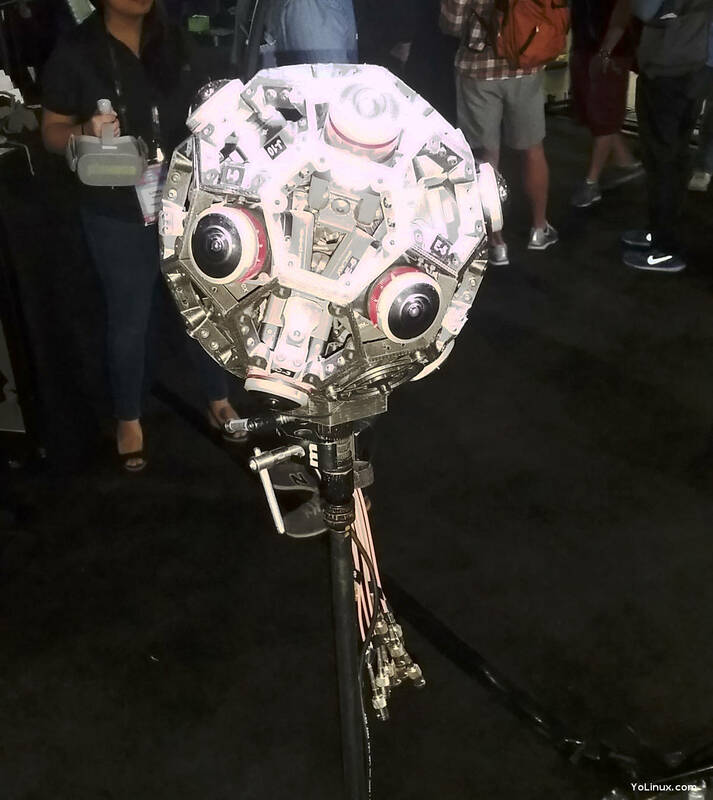 Github hosts the open source software used to capture and stitch the videos together and generate 360 stereo 3D video. Spherical Panoramic Photography is the 360 degree view of a single point, looking outwards and is enabled by stitching complete coverage of the sphere as formed by that point. Structure from Motion (SfM) generates an imaging experience where the view is on the outside looking in at the object. This allows for an unlimited number of view points and thus it is impossible to have 100% photographic coverage. Thus photographs are used to generate points to define a 3D point model from which one can generate a faceted 3D model upon which photographic texture maps can be applied. This 3D CAD model can then be viewed from any direction. At first custom viewers were used but now that most browsers support WebGL, it has become the leading web format. Microsoft is building the Microsoft Photosynth.net software and cloud service to generate SfM models. 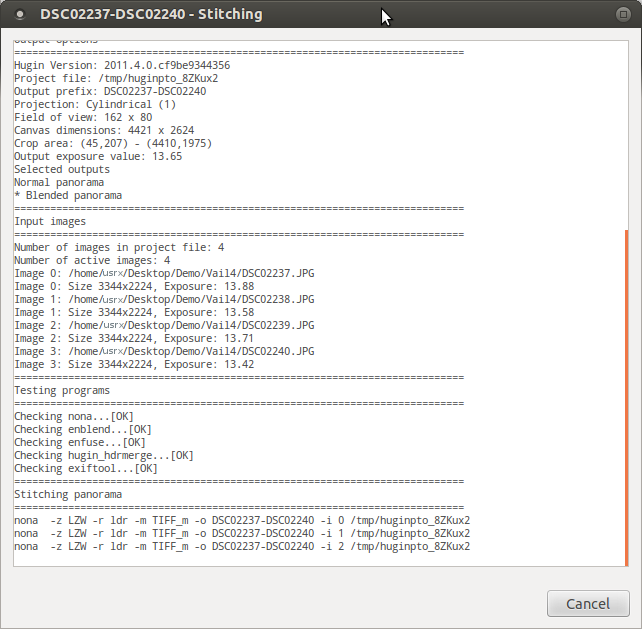 The Microsoft ICE program stitches photos and Microsoft Photosynth is used to generate and publish the SfM model to the Microsoft cloud. The client not available for Linux. The first SfM software was developed by universities and public institutions in both the USA and Europe and made available to the open source community. 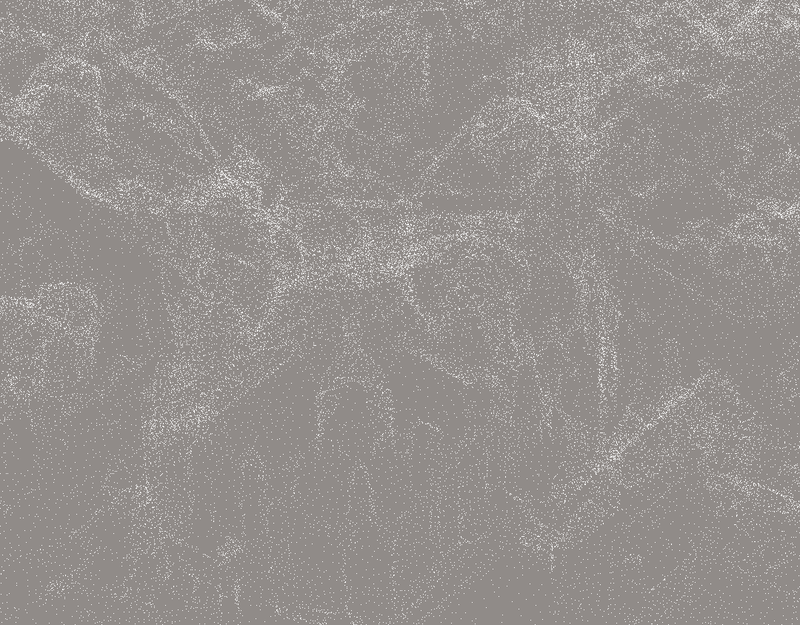 Step 1: Generate the point cloud from photographs. 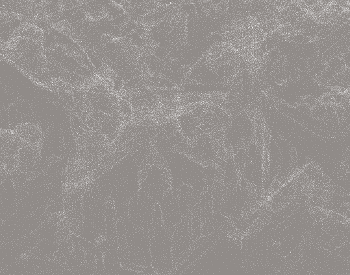 Bundler: Generate sparse point cloud from multiple unordered photos. Images must have EXIF focal length info. 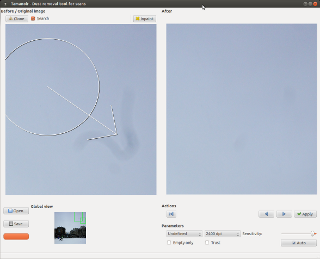 Outputs bundle.out and “.ply” camera information (view with Scanalyze). Bundler uses SIFT key point and feature recognition libraries and Ceres large nonlinear least squares solver. 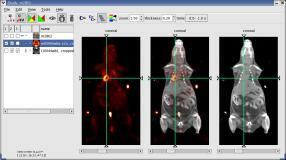 PMVS2 / CMVS: Clustering Views for Multi-view Stereo: PMVS2 generates a dense point cloud. Uses Bundler to obtain camera parameters. Run Bundle2PMVS to generate input to PMVS2 from Bundler “.out” files. CMVS used to substructure photos and model so that it is manageable. Uses Bundler output. PMVS2 included with CMVS download. Large Scale Sequential Processing (sfmseqv1 and sfmseqv2) eg ordered data if your source is Google Streetview. MeshLab: mesh generation from point cloud, edit points and 3D triangular mesh models. 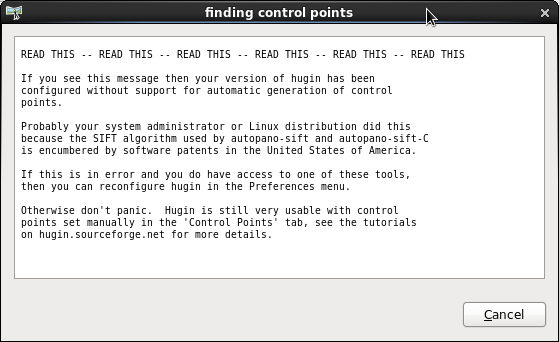 GUI program. PoissonRecon: Screened Poisson Surface Reconstruction. Command line tool to convert ply formatted oriented points into a surface mesh. CMP-MVS: mesh/model generator (NVM file >> CMP-MVS format) Command line executable. Newer versions are only available as an MS/Windows executable. No other platforms and no source. Requires CUDA GPU support. CMVS: takes SfM image input and generates sets of image clusters of a manageable size. Subdivides image models so processing and use is manageable. CMVS/PMVS: takes SfM image input and generates sets of image clusters of a manageable size. Subdivides image models so processing and use is manageable. Autodesk 123D Catch: This product is MS/Win only. Requires a good internet connection to the Autodesk cloud where much of the processing is performed. Uses licensed Acute 3D technology. There should be a two thirds overlap of images from one image to the next and limited change in camera angle (15-20 deg) from photo to photo. 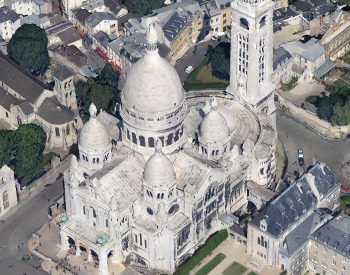 Acute 3D recommends: "For aerial photography, a longitudinal overlap of 80% and lateral overlap of 50% or more are recommended. To achieve best results, acquire both vertical and oblique photographs ..."
Fully exposed (no large dark underexposed shadows) images are best. Photos taken at noon may reduce shadows. Indoor photos with fixed light is preferable to flash. Manual exposure settings help reduce the color discrepancies in the texture map. Auto mode can lead to variations if the exposure is changed from photo to photo. Use a fixed focal length for all of the photos. Avoid optical and digital zoom changes between photos. Reflective surfaces (mirrors), surfaces with no color variation and transparent objects can be problematic for object (non-terrain) models. This often leads to holes in the model. 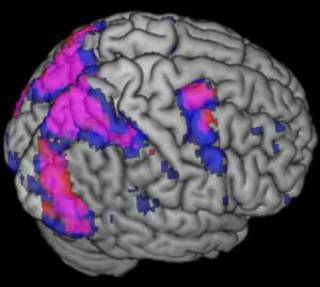 Feature detection, recognition, processing, analyzing, and understanding images and video. This field has been expanded to include tracking and event detection. 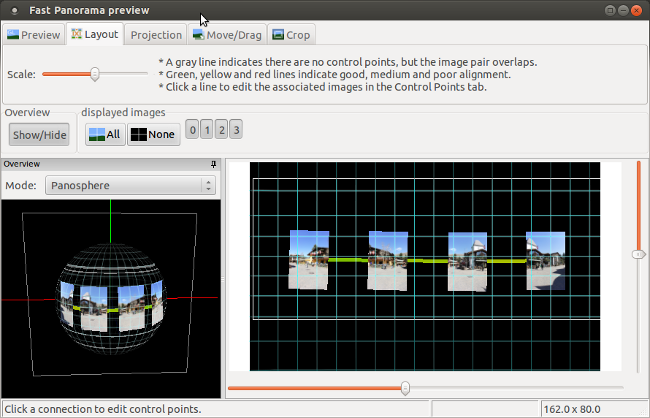 OpenCV: image recognition, image tracking, images/video. Integrated with CUDA/OpenCL to use the GPU. ROS: Robot Operating System: Includes lots of Computer Vision algorithms for robotic operation and automation. SIP: SCILAB Image Processing: filtering, blurring, edge detection, thresholding, histogram manipulation, segmentation, mathematical morphology, color image processing, etc. Tesseract OCR: convert images to text in over 60 languages. Sponsored by Google. Leptonica: image processing library used by Tesseract OCR. OCRopus: use of large scale machine learning for addressing problems in document analysis. Introduction to digital imaging covering core techniques of image capture and display of monochrome and color images. Presents fundamental tools within a powerful mathematical framework. Suitable for advanced undergraduates and graduates in electrical engineering and computer science, and practitioners in industry. 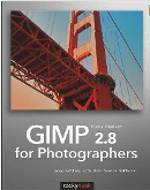 "Gimp 2.8 for Photographers: Image Editing with Open Source"
"Xara Xtreme 5: The Official Guide"
How to use QuickShapes, draw vector paths, use fills for photo-realistic effects, and compose professional desktop publishing documents. Concept to completion with examples that span a range of art styles--using the vector drawing program that thinks it's a bitmap editor. 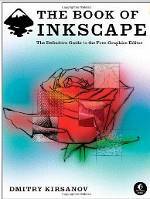 Graphics design guide to generate complex shapes, stylized text, use filters and work with images. 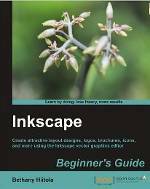 "The Book of Inkscape: The Definitive Guide to the Free Graphics Editor"
From the basics of using the program: drawing, working with objects, transformations and styling, adding text and shapes to how to create business cards, animations, and technical and artistic drawings. 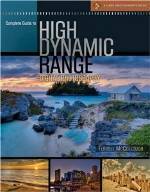 "Complete Guide to High Dynamic Range Digital Photography"
Thorough, easy-to-follow, and visually spectacular guide.